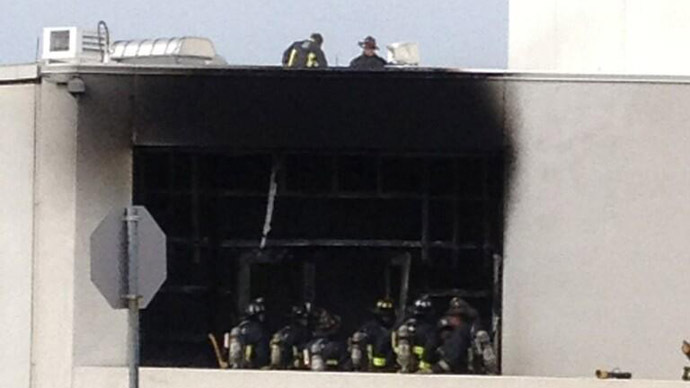 Police say there is no evidence yet linking the Boston Marathon explosions to a fire at the JFK Library shortly after. Earlier two devices exploded at the event's finish line, killing two people and injuring over 100. Boston Police Commissioner Edward Davis now says the 4:30PM library incident was in all likelihood not related to the Marathon explosions. It has been described as a mechanical fire from an "incendiary device", rather than a blast. An investigation is underway and a connection to the earlier Boston Marathon blast has still not been firmly ruled out. There were no deaths or injuries in the library incident. Employees and journalists were not allowed to approach the building. There was reportedly a smell of burnt vinyl around the library. People have been urged to stay indoors and avoid gathering in large groups. "People should be calm, but should understand this is an ongoing event and we need all the information we can get," the police said. They are currently stabilizing the situation, checking witness reports and scanning packages.